The 4,650-square-foot house in The Ramble Biltmore Forest is a standout because it’s one of the first contemporary homes in the master-planned community. Mark Goldberg (left) and Jeff Sadagursky designed and decorated their dream home, where pups Izzi and Gracie rule the roost. In the great room, clerestory windows allow in ample light. The floor-to-ceiling marble fireplace and inviting views through large sliding glass doors vie for attention. While works by local artists are displayed throughout, many furnishings were sourced online. The sleek, modern hardware in the half bath was purchased from a store in Fort Lauderdale. The kitchen, a replica of the one the couple revamped at their old house, features custom cabinetry and granite countertops. In the master suite, the open bathroom, with a tub, dual shower, and access to a private deck, is quite the dream. The bedroom, with access to the back deck, and a separate walk-in closet complete the 700-square-foot sanctuary. A metal Earth fire pit draws guests outside, while 1,575 square feet of covered porch and patio hold an outdoor kitchen, ample seating areas, and a hot tub. The aviator-inspired office furniture, found at Restoration Hardware, is a nod to Sadagursky’s career in the airline industry. A downstairs guest bathroom features linen-textured handmade tiles from Japan. The long porch is a dream for entertaining, with an outdoor kitchen at the far end. A modern bar cart makes entertaining easy. The curve came first. The graceful arcs in the roofline of Mark Goldberg and Jeff Sadagursky’s home were the jumping off point for the design of the couple’s 4,650-square-foot home in The Ramble, informing the way the rest of the home would take shape. But while this eye-catching feature sets expectations for a decidedly modern design, the result is far from cold and impersonal. The house balances contemporary elements with a sense of hospitality. The primary focus of the house, says Sadagurksy, was welcoming friends and family. For 16 years, the couple lived in a century-old house in Asheville’s historic Montford neighborhood, which they completely renovated, ensuring it would be around for another 100 years, says Sadagursky. When they began to think about making a fresh start in 2012, they decided not only to build rather than renovate, but to design the home themselves, relying on Goldberg’s prior experience as a general contractor and their own sense of aesthetics to achieve their vision. Goldberg focused on designing the space while Sadagurksy took charge of the finishes and décor on the project, which was completed in 2014. The new home was certainly a departure from their house in Montford, but in spirit at least, the couple didn’t want to do a complete 180-degree turn. “We didn’t want to go over-the-top contemporary,” says Sadagursky. Rather, they arrived at a design that feels inviting and reflects their personal sense of style. Outside, cut-granite facing contrasts with metallic blue accents, warm grey concrete-board paneling, and exposed wooden beams that extend from the inside out. There’s a hint of Asian inspiration in the torii gate-style front entrance and landscaping by Martin Vinson. Each influence is subtle and blends to contribute to a fresh, appealing sensibility. Walking into the light-filled great room—with its 21-foot ceiling, towering marble fireplace, and ebonized bamboo floors—the feel is undeniably modern. The Lucite dining set and Schonbek crystal chandelier in the dining area are elegant, while the Hoss Haley piece—made from hammered washing machine panels—contributes an element of surprise and is given its own room to shine without being showy. The kitchen—nearly identical to the one they designed in Montford—is divided from the great room through a partial wall, but the soaring ceiling carries over, giving it an open, airy feel. The Brazilian granite countertops and backsplash (procured locally from The Nature of Stone in Fletcher) are dramatically beautiful, contrasting with the dark wood cabinetry. Both Goldberg and Sadagursky love to cook, so the Thermador range is more than just a showpiece. The open shelves in the pantry allow the couple to display some of their smaller artworks, ranging from functional ceramics to inherited family heirlooms. The master suite, located on the main level, can be closed off from the great room by pocket doors, creating a lush retreat. The spacious, spa-like bathroom (with separate temperature controls for the rain showerhead and two adjustable spray heads) opens onto a private deck and small herb garden. The sense of soothing escape extends to the master bedroom and even the walk-in closet, which is outfitted with floor-to-ceiling custom built-ins that allow space for displaying objects with personal history and meaning. “We wanted the things we got from our family out where we could see them and enjoy them,” says Goldberg. Local and regional art plays an important role in the house, thanks in part to the couple’s long-term relationship with Blue Spiral 1 and New Morning Gallery owner John Cram and Constance Williams of Surface Gallery. Works by area artists Marie Hudson, Mitchell Lonas, Ward Nichols, and Barbara Fisher take prominent positions throughout the house. The couple’s taste isn’t limited to a single style or medium: Mixed-media pieces, three-dimensional works, and paintings ranging from representational to abstract are on display. More personal touches include nods to Sadagursky’s 20-year career as a flight attendant, supervisor, and recruiter in the airline industry, ranging from a display of his “wings” in the master closet to photos and art in Goldberg’s office on the lower level. A wine cellar next to the office holds generations of family glassware along with the couple’s own selections. And classic furniture handed down in the families is integrated with contemporary pieces throughout the house, too. 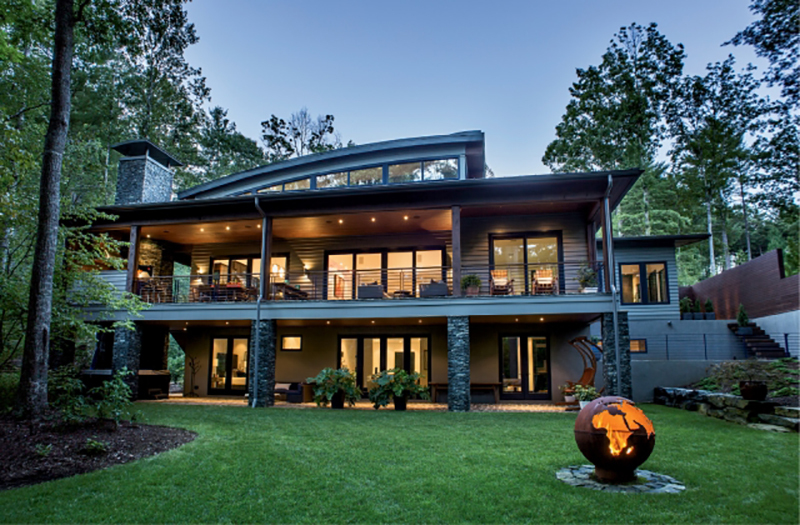 Taking advantage of the privacy afforded by their wooded lot (with no neighbors behind), the couple designed a main floor deck and lower-floor patio that run the length of the house, adding 1,575 square feet of covered outdoor living space. Off the kitchen, there’s an outdoor kitchen with a pizza oven next to a seating area. On the far end of the deck outside the master bedroom, two rockers by local woodworker Brian Boggs allow a quiet moment overlooking the metal fire pit and expanse of woods. On the lower level, two guest rooms have a private exit onto the patio, one leading to a Brian Boggs bench swing outside, the other situated near the hot tub, outfitted with privacy curtains that can be drawn or tied back. When they started the process of designing and building a new home, the couple was convinced that they would never live in a gated community. But The Ramble defied their expectations of what that could mean. “We started meeting people here, and everyone has just been wonderful,” says Goldberg. Now after two years in the community, the couple are convinced they made the right choice. Goldberg is now retired from his position at Asheville-based international key card manufacturer PLI, where he was a cofounder, president, and CEO, and Sadagursky is retired from the airline industry. This house, it turns out, was the perfect place to land.